The UN’s secretary-general has called on EU leaders to set an example and agree on an ambitious 2030 target at a Council Summit in June, that can be taken to a UN conference in Lima three months later, and shape a global, legally-binding treaty by the end of 2015. The EU executive has proposed a 40% cut in greenhouse gas pollution and an aspirational 27% market share for renewable energies to be achieved by the end of the next decade, that Ban Ki-Moon said he strongly supported. But under pressure from Poland and other east European states, the bloc’s heads of state failed to agree the package at a Council meeting last month, setting an October deadline for reaching consensus instead. 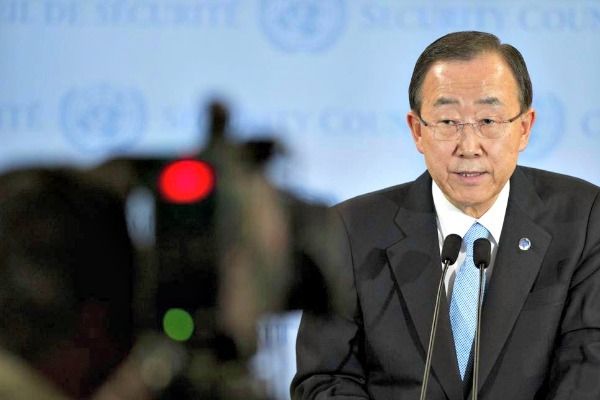 Ki-Moon blamed “political situations like the Ukraine, and the EU’s dependency on gas and oil energy,” for the impasse. If the EU brings no pledges to the UNFCCC conference in Lima, reciprocal concessions from other UN states are unlikely. That, in turn could jeapordise chances of a post-Kyoto Protocol deal at the Paris COP (Conference of Parties) in December 2015, and signal geopolitical paralysis in the face of a rapidly warming planet. Global emissions today are already 60% higher than when the first Intergovernmental Panel on Climate Change (IPCC) report was produced in 1990. Earlier this week, the IPCC’s 5th Assessment report concluded that climate change had already begun and posed an “unequivocal” and “unprecedented” threat to biodiversity, food and water supplies, and human security. A sense of urgency from the UN secretary-general’s office was palpable. The EU has committed to a 20% cut in its emissions by 2020, compared to 1990 levels – a target it is on track to meet – and last year saw its emissions fall a further 3.1%, according to Thomson Reuters Point carbon. Critics though say by counting carbon output at the point of production rather than use, the bloc has merely outsourced much of its greenhouse gas pollution. Scientists like Professor Kevin Anderson, the deputy director of Manchester University’s Tyndall Centre for Climate Research argue that the EU has botched its maths, and even meeting its 2030 target would only offer a 50-50 chance of keeping global temperature rises below 2 degrees. Europe’s headline figure at least compares well to that of President Obama, who inherited a climate policy detached from Kyoto commitments under George W. Bush. Obama has promised merely to reduce carbon emissions 3.5% below 1990 levels. But EU leaders are also increasingly under-stated about climate action and talk with ever more conviction, volume and pitch about the need to strengthen Europe’s industrial competitiveness through access to cheaper energy prices. The recent Ukraine crisis sparked some calls for increased energy efficiency, but louder ones advocated a fracking boom , despite the potential high environmental costs and limited economic gains. Lies Craeysnest, a policy advisor for Oxfam, said that Ki-Moon’s real message had been aimed at EU businesses and states that were trying to delay climate action. “At the June summit, EU leaders need to stop dithering and unequivocally signal that ambitious and comprehensive EU climate action will no longer be held hostage to short term narrow-minded interests,” she told EURACTIV. Ki-Moon had talked wearily of “world leaders who are narrowly looking to a national agenda” and said that by the time they were ready to act, “I will have left my job and everyone will have to regret what we’ve neglected”. Perhaps the most divisive issue still to be settled at the UNFCCC level involves the Kyoto Protocol’s commitment to ‘common but differentiated responsibilities’ (CBDR). Addressing the question of ‘who pays?’, it says that countries which industrialised first, emitted most historic carbon, and possess the greatest mitigation capabilities, should shoulder a greater emissions-cutting burden. The concept has been somewhat occluded by financial crisis, China’s economic rise – the country last year emitted more CO2 than the US – and concerns in the rich world, particularly the US, that the Global South could obtain a competitive disadvantage, while the North is decarbonising. By 2020, a planned $100 billion-a-year Green Climate Fund is supposed to be in operation to help poor countries to mitigate and adapt to the effects of global warming. As of the end of 2012, just $30 billion had been raised. Ki-Moon also launched an impassioned defence of the CBDR principle: “Everyone has a common responsibility whether you are rich or poor but at the same time there should be some differentiated understanding,” he said. Climate change was “largely caused by the developed world during the last 200 years,” he added. As he spoke, on the other side of Brussels finishing touches were being put to conclusions for the EU-Africa summit that were also relayed yesterday. An early draft of the document, seen by EURACTIV, contained a bracketed passage proposed by the African bloc, calling for a global climate deal in 2015 to be based “on the principle of common but differentiated responsibility”. The words were excised from the final text. The EU’s 2030 climate and energy framework package was presented on 22 January 2014 as a successor to the three 20-20-20 targets of 20% greenhouse gas cuts, improvements in energy efficiency and renewable energy market penetration, all by 2020. The energy efficiency goal is non-binding and remains the only one the bloc is not on track to meet. What is the European Commission doing about climate change?